While you are in the midst of one holiday, it can be hard to start thinking about the next one. I've got Christmas holiday decorations in all stages of display yet I have to start thinking about Valentines because I have a card class in January. Actually Christmas is the perfect time to begin gathering supplies for Valentine's day because of a shared color scheme. You probably have some red papers lying around and maybe some fancy gold, silver or textured whites, too. These are perfect for Valentines. 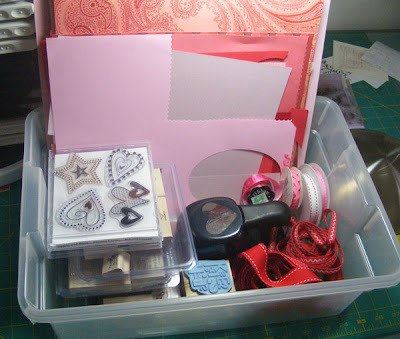 So when you wrap up the Christmas cards, tags and decorations, toss those scraps into a bin for Valentine's Day. I went through my papers - the good stuff that hasn't been cut - and my scrap bins. Also I pulled out stamps and punches so I could see what I had and needed. In my ribbon canisters, there were also some pretty choices. We may do a card or two in class in non-traditional colors for Valentines. For now, I have a good start when I want a break from Santas, trees, and presents.